Dr. Rimm recommends these books to help students, parents, teachers and administrators. Quantities are limited and once sold-out cannot be restocked. The Guidebook will assist teachers and psychologists in making better use of the contents of Why Bright Kids Get Poor Grades in their schools or schools. 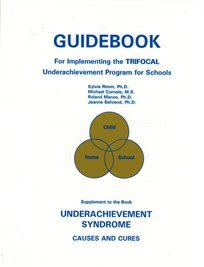 It provides a framework for implementing the Trifocal Model: a step-by-step approach for establishing a program for underachievers, written by the staff at Family Achievement Clinic who use the Trifocal Model on a daily basis. Stories about teenagers who are experiencing problems are based on the real lives of adolescents. Some themes include achievement, popularity, family relations, peer pressures, independence, loneliness, friendship, and giftedness. The book also includes some stories and poems written by teenagers. Teachers and parents can help teenagers explore ideas from Gifted Kids Have Feelings Too. Questions and curriculum activities include creative writing, oral history, interviews, surveys, and critical-thinking options to encourage teenagers to think about the themes of the stories. Order by clicking the Add to Cart Buttons above or by calling 800-795-7466, or click below to view a printable order form to return with payment by mail or by fax to 920-261-6622 with credit card information.